"Not reaching the performance we wanted"
The arrival of tablets and lightweight, high-end 'Ultrabooks' has meant that the future for the netbook is looking rather bleak. This is according to Kas Yoshida, president of Intel Japan, who told TechRadar and other journalists that the netbook form factor could well be on the way out. 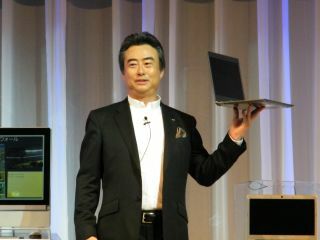 Fresh from his keynote speech at CEATEC 2011 in Japan, Yoshida explained: "The netbook was a very interesting product as it enabled a lower price point which helped expand the [PC] user base. "However, it did not grow as much as we expected. It turned out to be a low-end booster rather than a focus on useability." Speaking about the Japanese market, Yoshida said that there's now much more of an interest in a higher performance, rather than the lower performance offered by netbooks. It is now all about the "thin and light" of the what Intel has dubbed the 'Ultrabook', and the performance and low cost offered by Core i3 and even i5 chips. "In Japan, 70 per cent [of chips shipped] are the high-end processors. So the netbook wasn't really reaching the performance we wanted. "Then the i3 and i5 chips came along and the price was similar [to netbook processors], this shifted away the demand. They are still selling but there is a definite shifting away." When asked if we have seen the end of the netbook, Yoshida noted: "It is hard to say whether the netbook is finished – price point is still very important with users."